This is the story of his remarkable life, of how he transformed small unfashionable Southampton into FA Cup winners (2016 is the 40th anniversary of the win against Manchester United) and produced a team from nothing to challenge for the First Division title. But that was only the start of a roller-coaster career - as stints with Sunderland, Graham Taylor's England and the managerial hot seat at Northern Ireland were to follow. On his way to the top, his charismatic personality convinced some footballing greats to sign for him - including Kevin Keegan, the biggest star of all in what was one of the game's most sensational transfers. McMenemy also talks for the first time about England, his role working with Taylor and the failure to qualify for the 1994 World Cup finals. The Saints hero also explains how it's only recently he has been persuaded to recall his extraordinary story of a career which saw him manage more than 1,000 matches at his clubs plus those with England and Northern Ireland.This disarmingly honest and uninhibited account covers what he did and didn't achieve as well as the agreements and disagreements in a highly competitive football world. McMenemy relates in detail why he turned down the chance to manage Manchester United and writes about some of the big names who have played for him: Keegan; Alan Ball; Mick Channon; Peter Osgood; Charlie George; Peter Shilton and Joe Jordan, among others. The former manager looks back at his tough time at the helm of Sunderland and reveals the sorrow he still feels at the reasons behind the fall-out with his old mate Brian Clough. 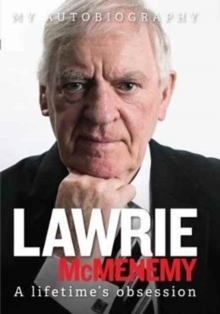 McMenemy, who also carved out a successful career as a respected pundit, recalls the highs and lows of his professional life, most of which were conducted in full public glare and never before recorded in such detail. This is an engrossing story, brilliantly recorded - a must read.